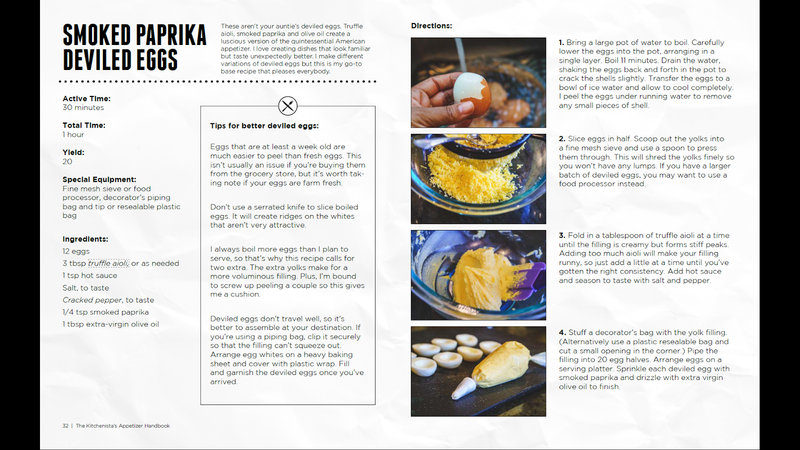 My second cookbook is now available for purchase! This is a project I've been working on for a few months so I'm excited to finally release it and get these recipes into your hands. 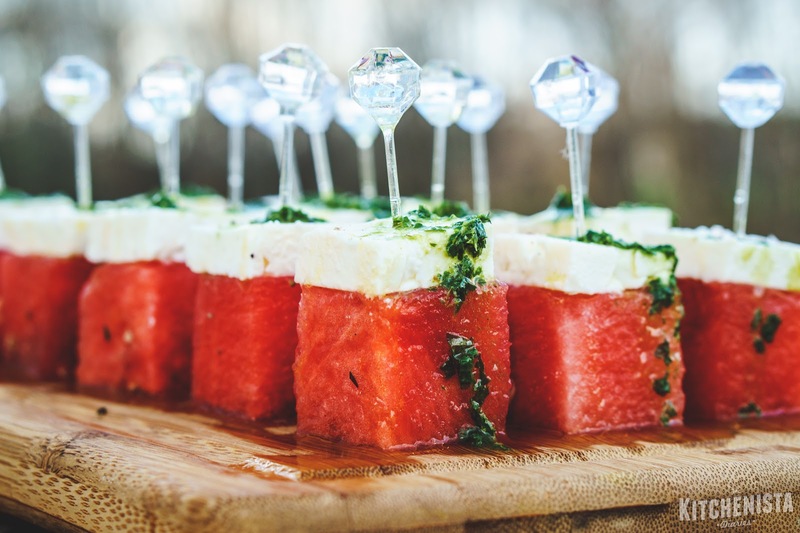 When I asked for ideas for ebook themes, my followers requested appetizers by an overwhelming majority. I wasn't sure how to tackle such a broad subject, so I dove in head first, cooking all of the appetizers I could dream up. Some worked, some didn't, but it was a fun and eye-opening experience. 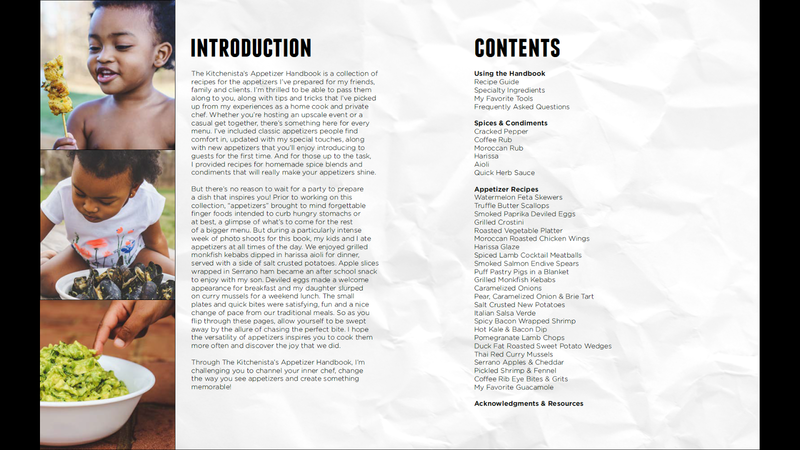 I started this project shortly after finishing my Thanksgiving ebook. 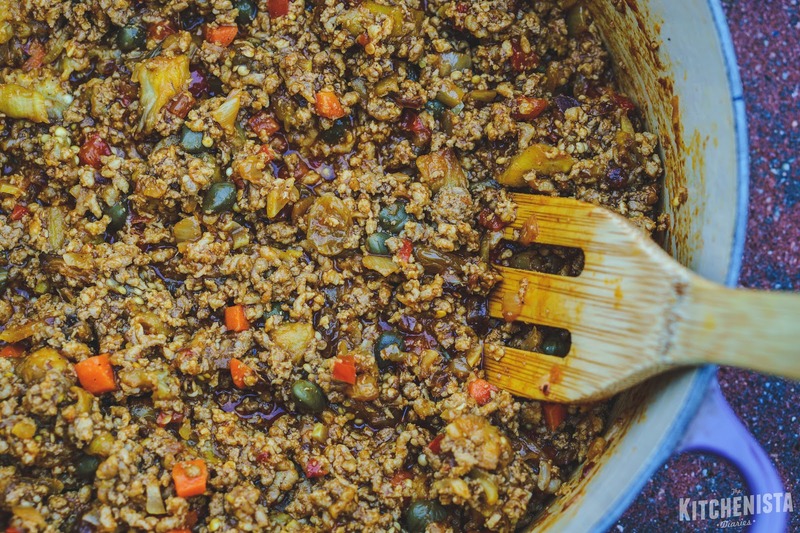 I'd been so wrapped up in my focus on structured holiday dinner recipes around that time that it became a really liberating thing to just make whatever the hell I wanted to eat, regardless of how it fit into a bigger menu. Little by little I chiseled away at my list of things to try, perfect and document. After more than a few bumps along the way, I am so proud to have a completed ebook that is full of beautiful photography and recipes I'm excited to share. 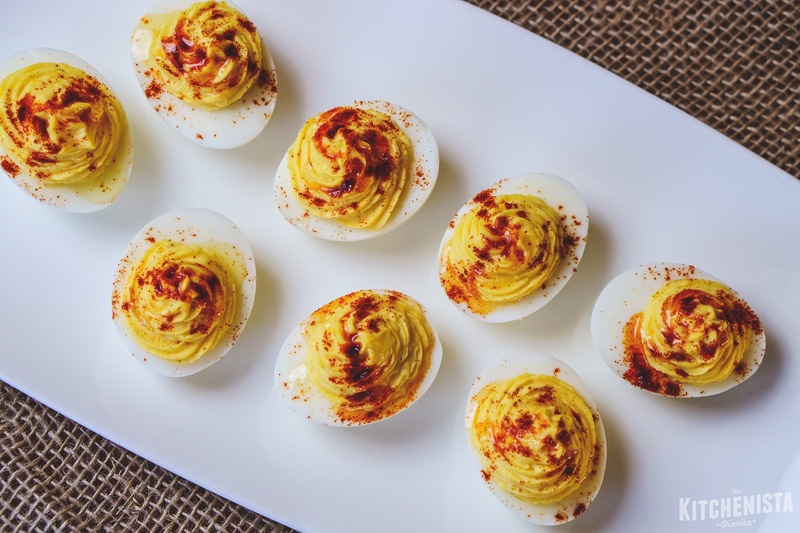 There are more than twenty detailed appetizer recipes, along with some spice blends, condiments and sauces that will really help to make your dishes come to life if you'd like to go all out. But it's flexible, for those of you who prefer to utilize more store bought ingredients for some extra help. 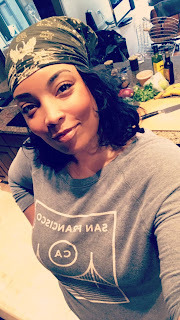 I've dedicated an entire section to sharing my experience on things like specialty ingredients and cookware tools you'll need to get the job done right. Sprinkled in between all the recipes are my tips and secrets to creating great appetizers. Thank you so much to everybody who has already, or will support this project! I'm already hard at work on the next ebook, and your purchases help to fund future projects. Please contact me if you have any questions or concerns with your download or about the recipes. I'll do my best to get back to you as quickly as possible. Also, for those who have asked - yes, I am hoping to also release this as a printed book. Details to come later next month, it takes awhile to receive proof copies and handle any final editing, so sit tight! I'll leave you here with a few more shots from the book. Happy cooking! 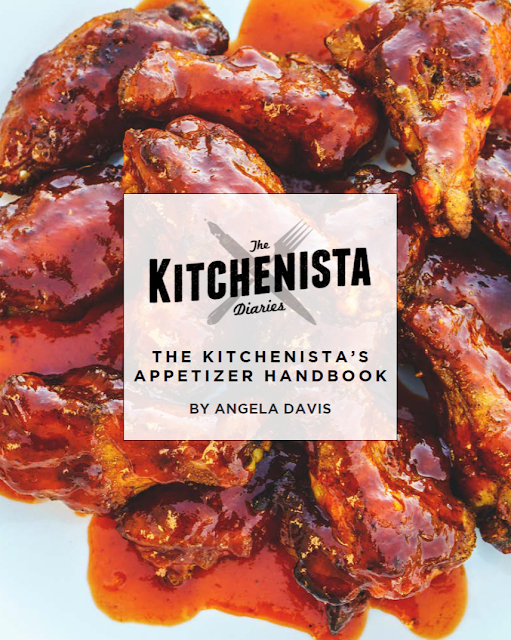 Click here to purchase The Kitchenista's Appetizer Handbook! ...and more! 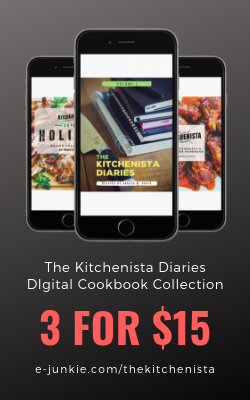 Purchase your copy of The Kitchenista's Appetizer Handbook today! Disclaimer: I received compensation and a product sample for this post. The opinions and text are all mine. 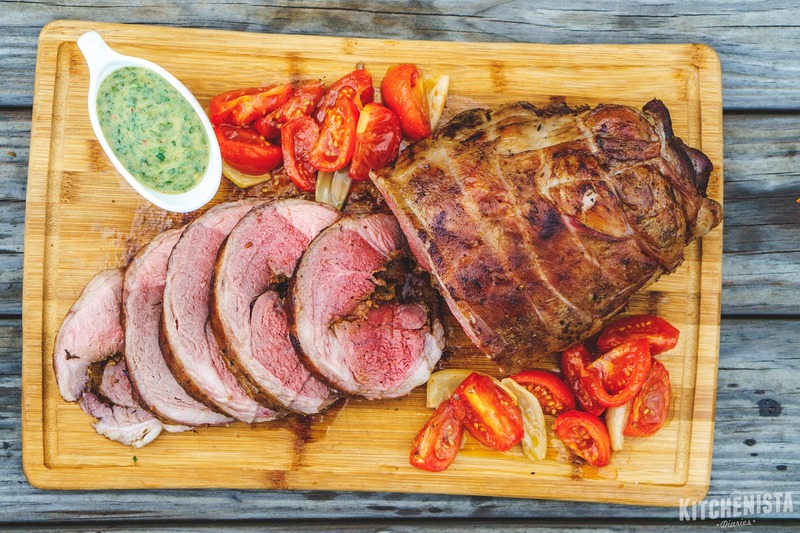 I'm back with another lamb recipe for the spring holidays! 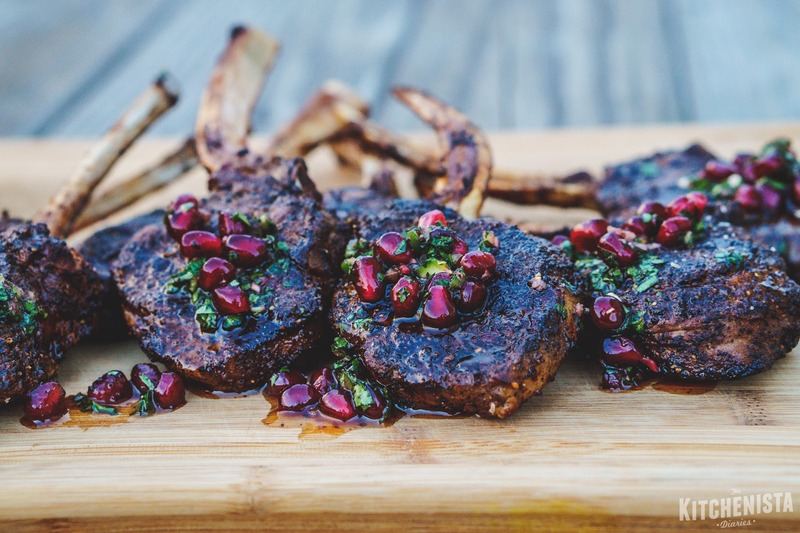 I've been excited about my partnership with The American Lamb Board this year, so this was a fun post to work on. Last summer, I spent a lot of time learning to grill and smoke meats outdoors. Now that our weather is returning to tolerable temperatures, it's a great time to get back out there and continue the adventure. As many of you may remember, we smoked our turkey for Thanksgiving last year. 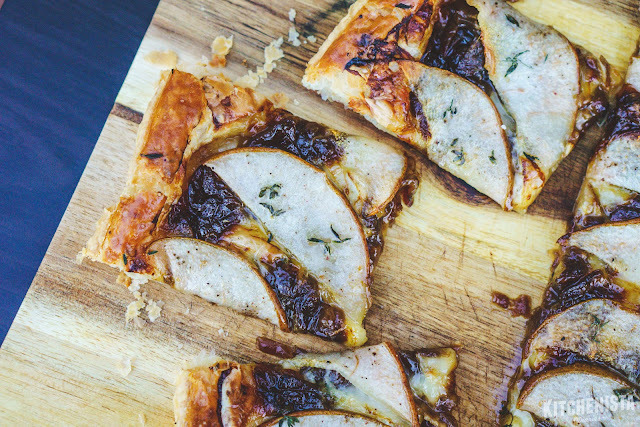 It turned out to make the rest of the holiday cooking easier, as it freed up the oven. When I received this beautiful leg of lamb to play with, I knew that smoking it would make for an interesting spring roast. 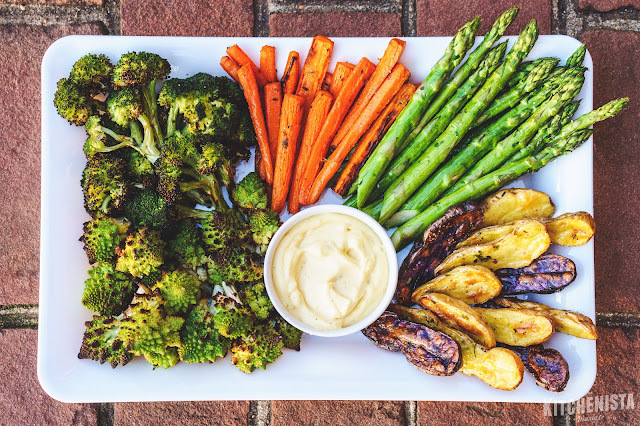 This was a great, low-carb and Whole 30 compliant weekend dinner and would be a fabulous alternative to traditional spring roasts. 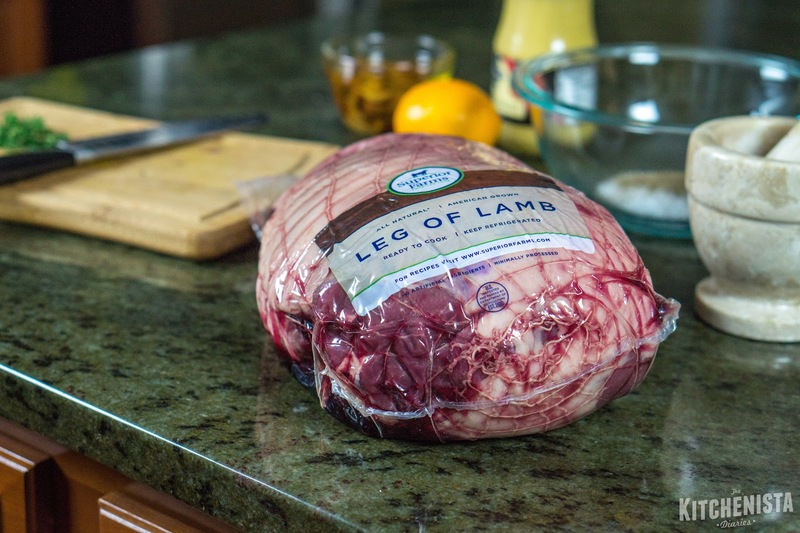 I chose to work with a boneless leg of lamb, which is the leanest cut of American lamb but still has great marbling within. 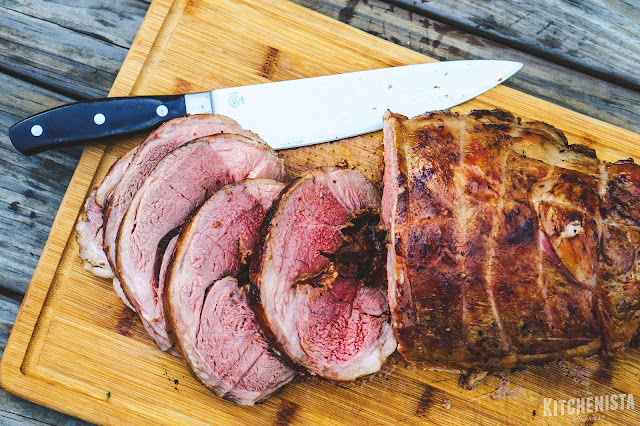 I've always loved the robust flavor of lamb, and definitely preferred this over the beef roasts I have cooked in the past. Because the bone was removed, I was able to open up the cut of meat and slather it with a garlicky mustard marinade inside. 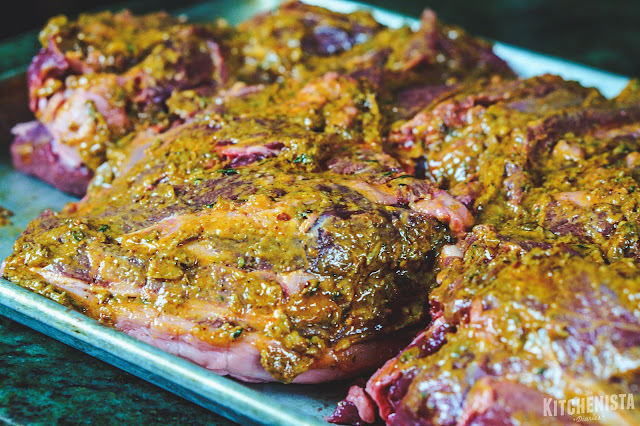 The salt in the marinade helped to season the meat from within, for more flavorful meat. All in all, it was a really easy process and took about half a day, not including the overnight marinade. The most challenging part was really just tying the roast up with butcher's twine. I totally did a hack job but my technique is getting slightly better. 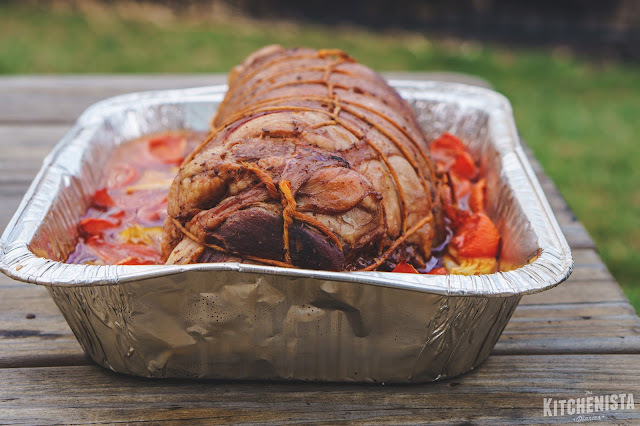 This video tutorial from The American Lamb Board helped a bit with that part (the roast is tied at the 1:45 mark) but the whole video was helpful for tips in working with a leg of lamb. My dad helped me by setting up the Weber Smokey Mountain Barbecue Smoker with applewood. The tied leg of lamb smoked for about three and a half hours total. I let it rest for thirty minutes and then finished it over direct heat on the grill to crisp the outer layer of skin, an optional step. 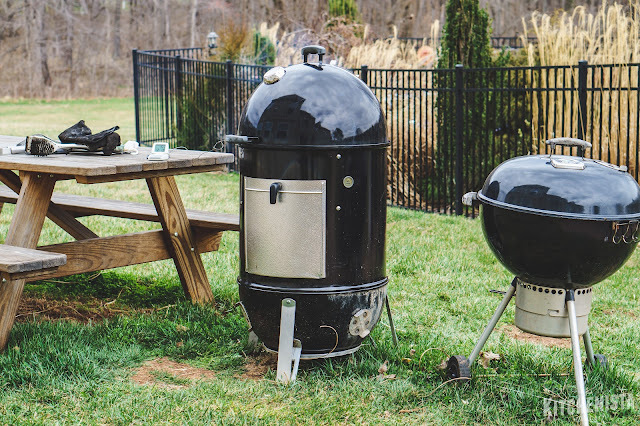 You can use any smoker with this recipe, just follow your manufacturer's directions for the ideal setup. I tend to peruse the bbq and smoking forums online whenever I try something new, and found great tips for our smoker at the Amazing Ribs site. 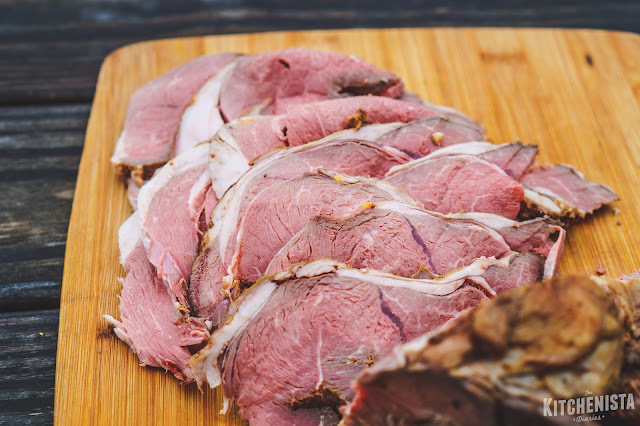 If you don't have a smoker to use and still want to work with a boneless leg of lamb in a similar way, you can roast it in the oven (use a roasting pan with a rack) at the same low temperature. You obviously won't get the benefits of the smoke for flavor, but you can achieve a juicy, medium rare roast for the holidays. *Note: You can purchase peeled, roasted garlic cloves or just make your own ahead of time. In a small ovenproof dish add the peeled cloves from two whole heads of garlic. Cover with olive oil. Roast at 300°F for about 45 minutes or until garlic is fork tender. I just do this whenever I have something else in the oven around the same temperature. 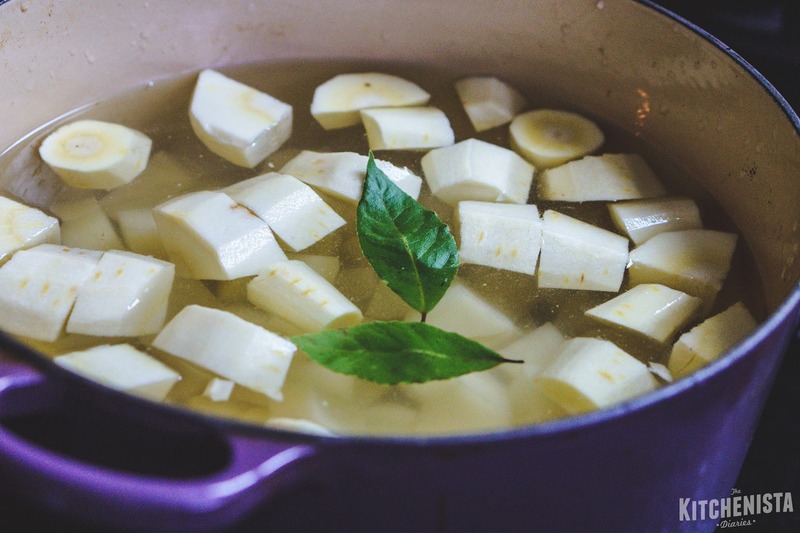 The olive oil gets infused with garlic so it can also be used in the recipe. Store leftovers in tightly closed jar, topped off with additional olive oil if needed. 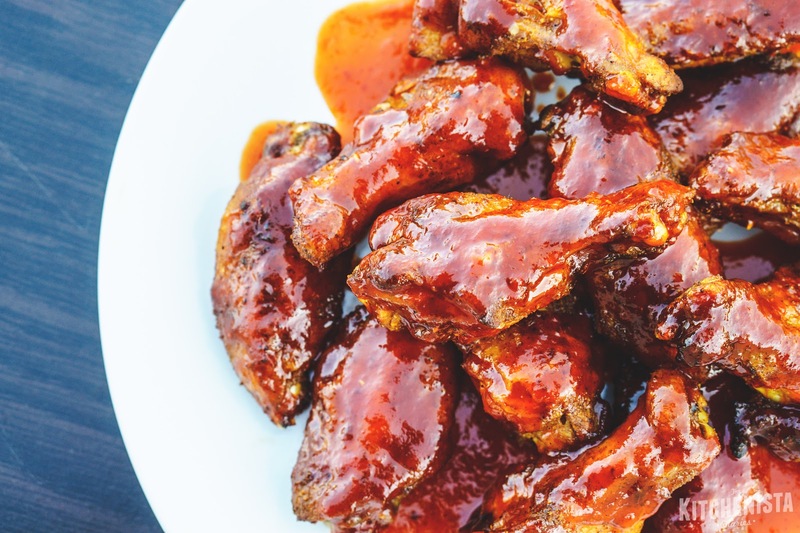 To make the marinade, add the mustard, roasted garlic, smoked paprika, lemon juice and zest, red pepper flakes, black pepper and salt to a small bowl. 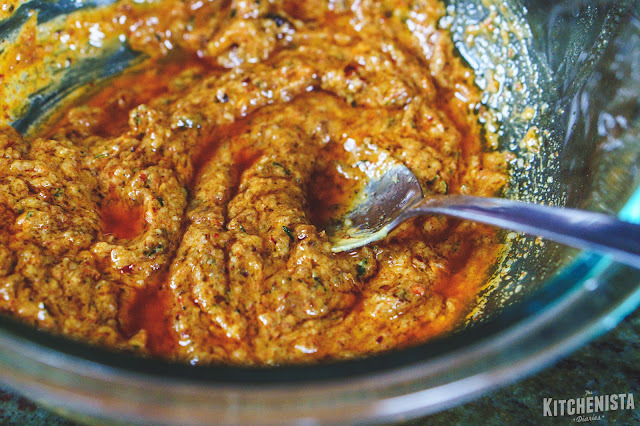 Mash the garlic into a paste with the other ingredients. Add just enough olive oil to make it a spreadable consistency. The next day, tie up the roast into a uniform shape, securing with butcher's twine. I wanted to smoke some tomatoes and onions to use in a side dish along with the lamb, so I opted to put everything in an aluminum pan. You can do that, or roast the lamb alongside potatoes for something more traditional. If you want to place the tied lamb leg right on the racks, just be aware that fat will drip as the lamb smokes. To monitor the internal temperature of the lamb as it smoked, I inserted a probe thermometer into the thickest part of the meat. I definitely recommend using one of those when you're slow cooking anything, whether in the smoker, grill or oven, because it allows you to keep an eye on the temperature remotely. 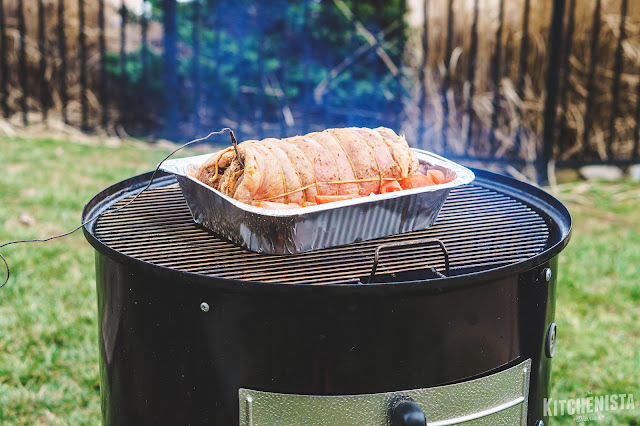 Especially with a smoker, where the goal is to keep the temperatures low and steady, constantly opening the smoker up to check on a piece of meat can cause big fluctuations in heat. As I mentioned above, we used applewood to smoke the lamb. It's best to use a fruity mild wood so as not to overpower the flavor of the lamb. 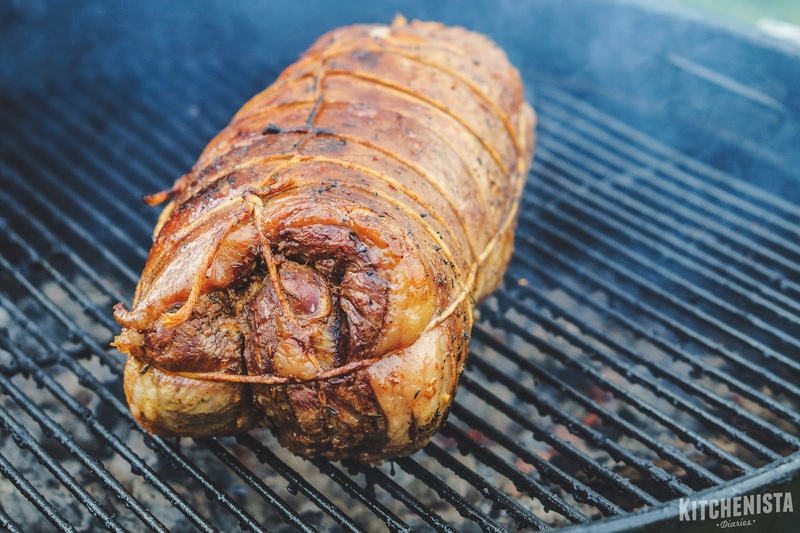 The lamb smoked for about three and a half hours at 225°F, until the internal temperature read 130°F. Leg of lamb is best served medium rare, so pulling the roast out a little early leaves some room for the residual heat to carry the temperature up a bit without overcooking it. Once the lamb was removed from the smoker, I let it rest for 30 minutes. Meanwhile, I made the mustard sauce by combining the mint, parsley, garlic, red pepper flakes and lemon zest in my mortar and pestle with a splash of olive oil, grinding and crushing the herbs until silky. I transferred that to a bigger bowl, stirring in the lemon juice, mustard and additional olive oil to make the sauce, then seasoned with salt and pepper. I'm a little obsessed with the way a mortar and pestle brings out the flavors in my herb based sauces these days. If you don't have one, you can combine all the ingredients in a food processor and pulse to combine, adding the olive oil at the end. Or, just very finely mince the herbs and smash the garlic by hand before mixing the remaining ingredients. Lots of options, so just do what works. After the lamb rested, I finished it off on the grill over direct heat to crisp the skin on all sides. That just took about 5 minutes total. Broiling the lamb for a few minutes would be an alternate method, just be careful not to overcook it after your work to perfectly smoke it. The lamb was ready to slice and serve immediately, since it had already been rested. I did nice thick slices, serving with the mustard mint sauce and some of the smoked tomatoes. 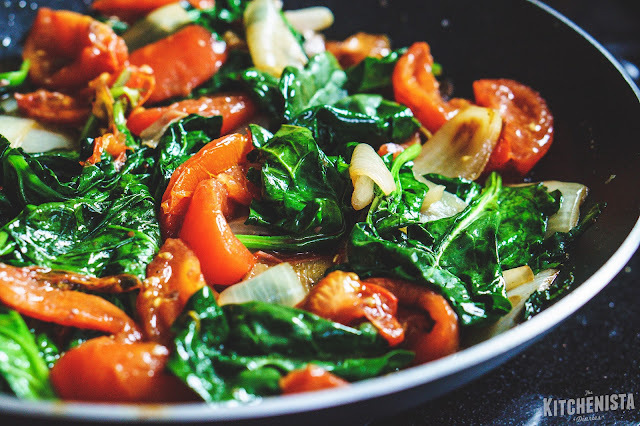 I used the rest of the tomatoes to make a quick side dish, sauteed with fresh spinach. One of the best parts of having such a large roast was all the leftovers! Over the next couple days, the smoked leg of lamb was great eaten alone or sliced thin for sandwiches, with some of that mustard mint sauce of course. 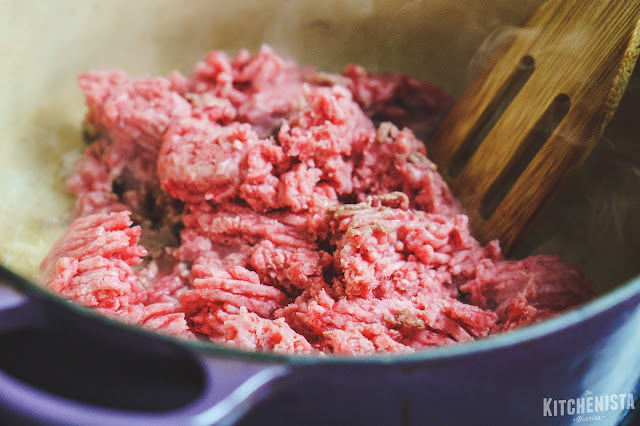 My son preferred to quickly warm his in a pan for a couple minutes, while I liked it cold, with excess fat pulled off. 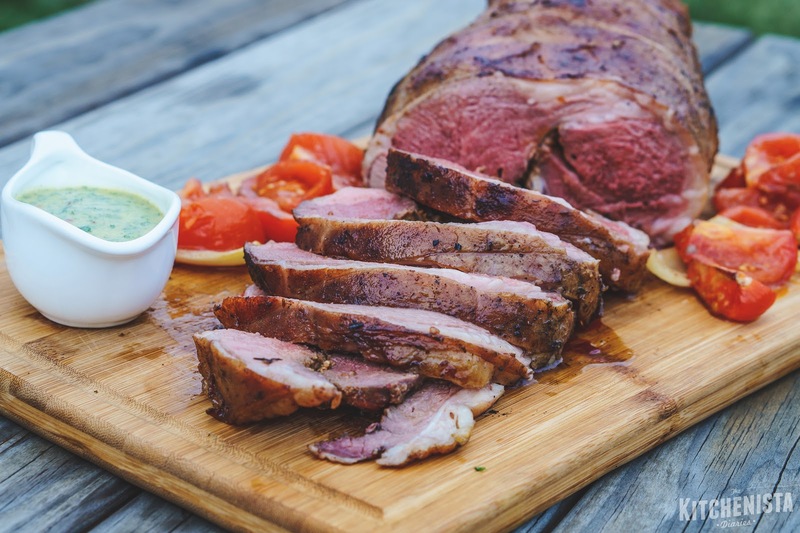 Give the smoker a run if you'd like to enjoy a nice leg of lamb for your next holiday dinner! 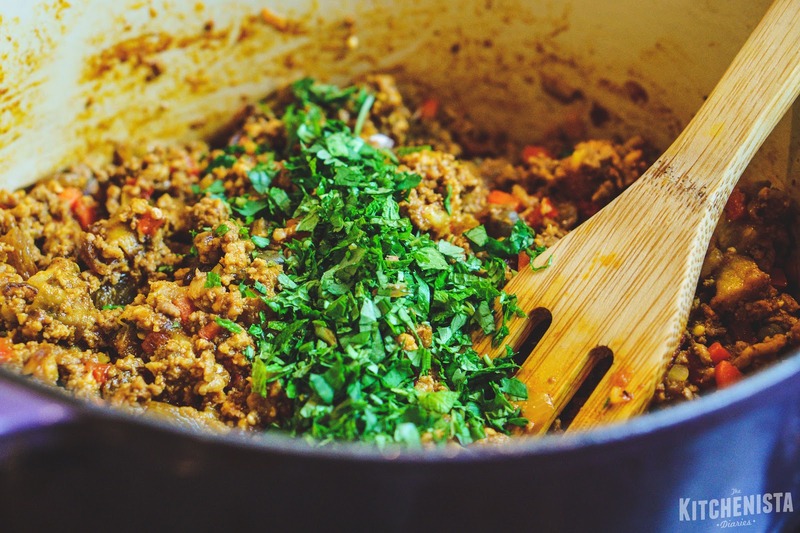 It turned out to be an easy, reliable method of cooking the lamb perfectly and can be adapted for any menu you have in mind. To find out more information about entertaining with American lamb this spring, check out The American Lamb Board's website! In an effort to celebrate more "food holidays" this year, I was excited to cook for Pi Day on March 14th. The only challenge was that it fell right under my last couple days of Whole 30, so any dessert pie or even a savory pot pie were out of the question. It dawned on me that I could make a Shepherd's Pie. I pondered that idea for a week and couldn't bring myself to get excited about Irish food. Despite loving lamb and mashed potatoes, I needed something else to liven this up enough to appeal to my palate. 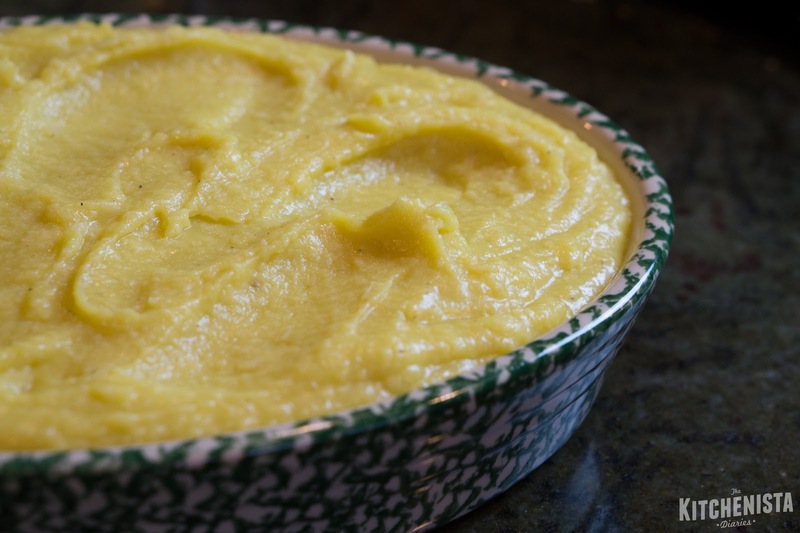 The answer turned out to be saffron, which inspired me to make the saffron mashed potatoes and parsnips from the last post. Once my brain headed in that direction, along with lamb in mind, I immediately knew Morocco was the answer. What I ended up with was a spiced ground American lamb and eggplant mixture, topped with a creamy layer of those saffron potatoes. 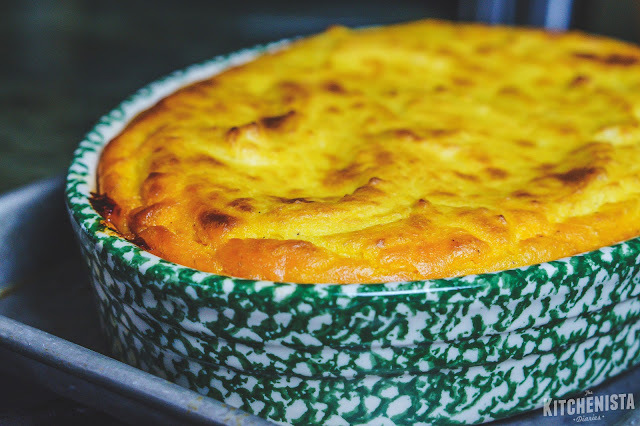 It was amazing and I especially loved how the texture of the mashed potatoes changed after being mixed with egg yolks and baked in the oven. 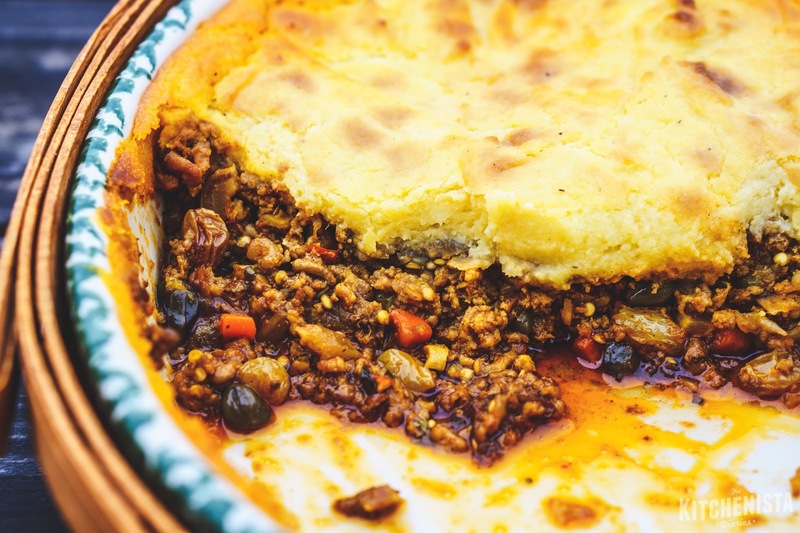 That alone made me want to reconsider trying a traditional version of Shepherd's pie, although next time I think I'd go all the way out and braise lamb shoulder instead of the ground meat. 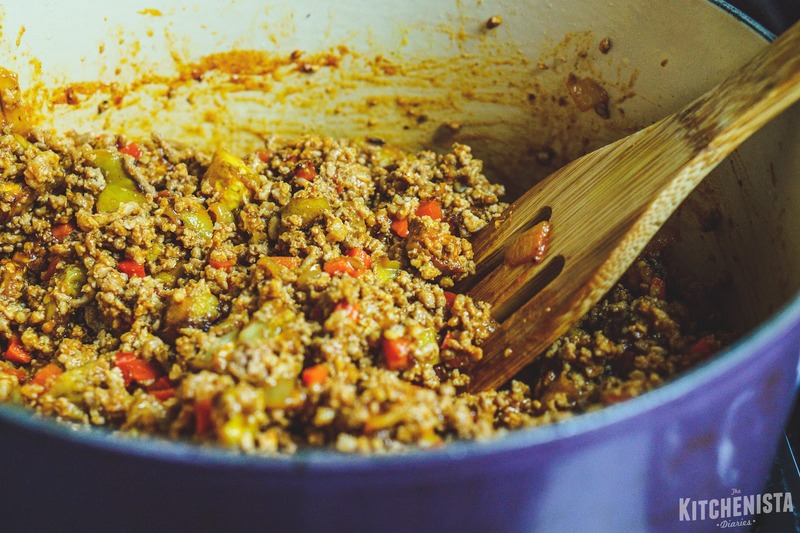 The meat filling was really interesting and reminded me of a Cuban beef picadillo. 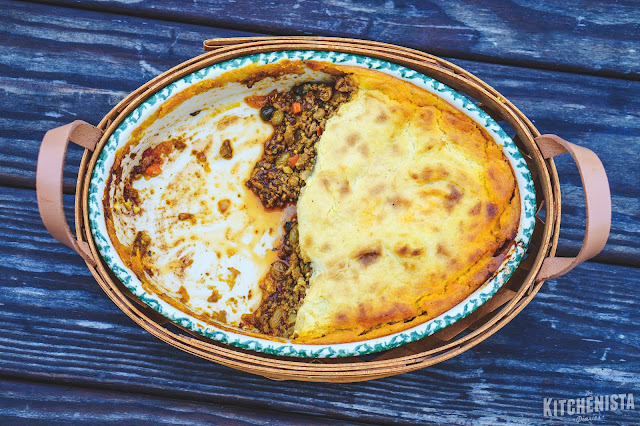 I wanted to mimic the vegetables in a traditional Shepherd's pie, but keeping with the Moroccan flavor profile. I turned to diced cubes of roasted eggplant, which melted into the meat and added a silky creamy texture. 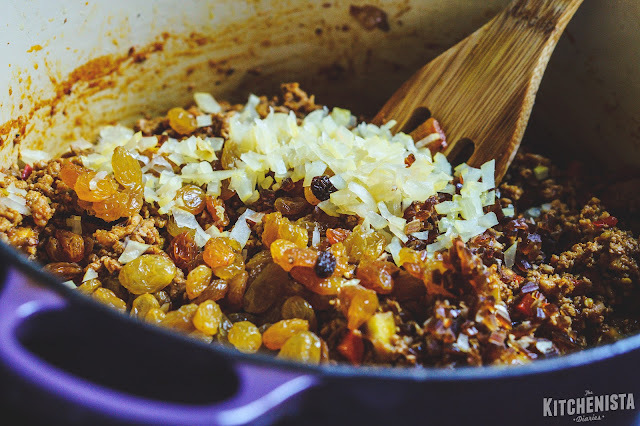 I also used carrots, golden raisins and chopped dates for sweetness, preserved lemons for brightness and caper berries for a punch of brininess (I hate peas but I thought it was cool to give the appearance of peas.) 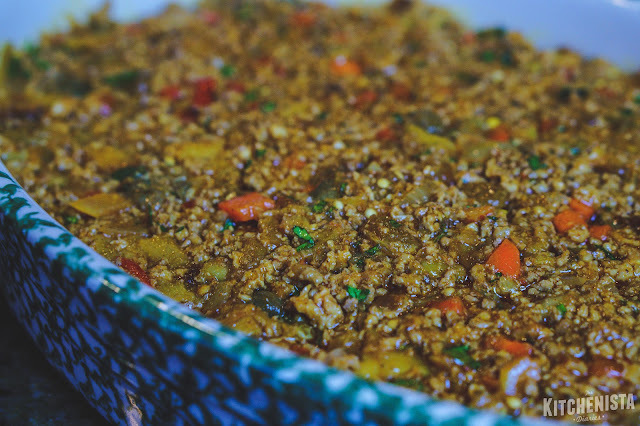 It was all seasoned with an aromatic ras el hanout spice blend. I suspect my homemade batch of gelatinous beef stock was also essential to the texture of the sauce; no thickener was required. I'm not usually nervous to "sell" a dish to my kids but I thought maybe I had pushed it too far this time with so much going on at once. Nope! They devoured it both days, and I actually found myself having to compete for leftovers. We'll definitely be enjoying this dish again! I've only made this once so it's more of a successful experiment that I'm sharing for this post versus a thoroughly tested recipe. Which I think is fine, and I've been meaning to do more of that anyway. Sometimes you don't need to make something a hundred times to know that it's good. 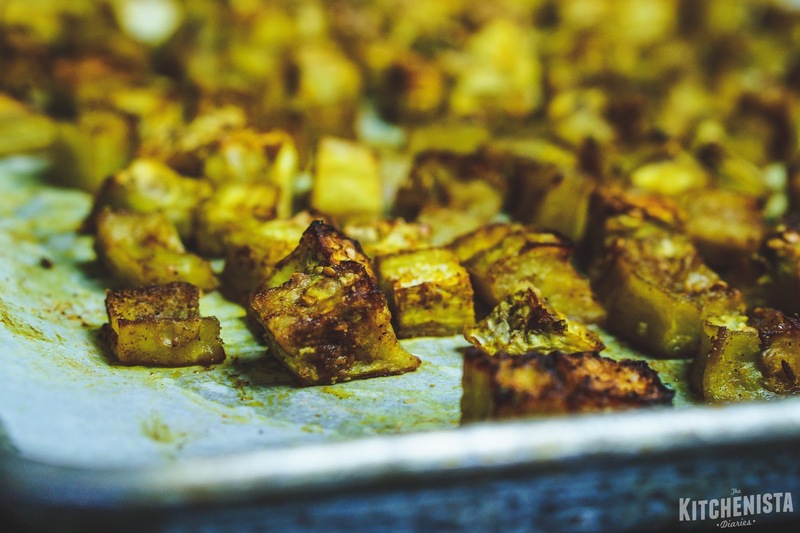 The little tweaks that we all inevitably make to recipes in our kitchens are what gives a dish its character. The takeaway here for me was that I was able to pull from a variety of dishes and cuisines that I knew well, in order to execute a dish that I'd never made before. It's cool that food connects cultures in this way. This is comfort food I'd be happy to eat on any day. 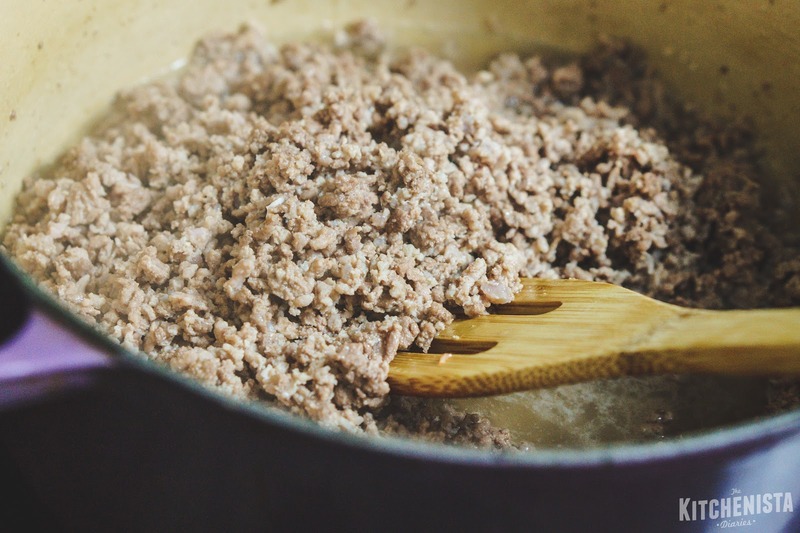 To my pot, I added the ground lamb, breaking it up over medium high heat. I cooked the lamb until no pink remained, then transferred it out of the pot and drained the fat. 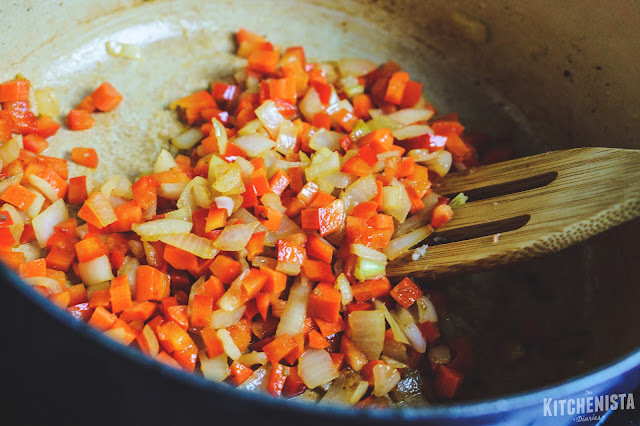 Back in the pot, I sauteed the diced onions, carrot and bell peppers in a little bit of olive oil, seasoning with salt and pepper. I cooked the veggies until they were tender and starting to brown, about 5 minutes. Next, I added the garlic, ginger, remaining ras el hanout spices, cinnamon and smoked paprika. I continued to cook the veggies for another minute until the spices were fragrant. 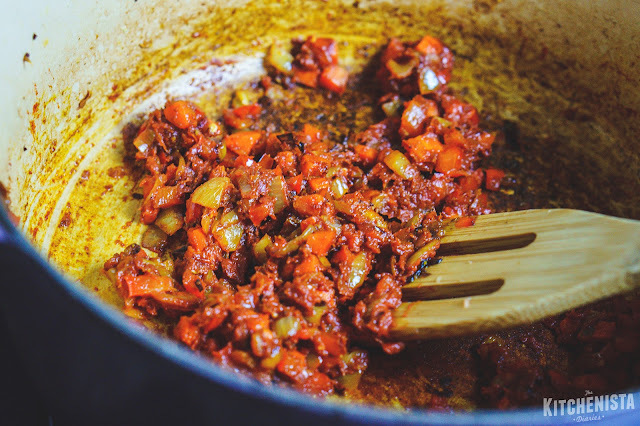 I then added the tomato paste, stirring it into the bottom of the pot to cook the raw flavor out for a minute. Then I began to build a sauce by pouring in my beef stock. Homemade beef stock is rich and has a ton of body to it, due to all the natural gelatin. This is how I was able to get away without using any kind of thickeners, like flour or cornstarch. You can improvise with homemade chicken stock, I just don't recommend store bought beef stock nor is it usually Whole 30 compliant. The stock helps to deglaze the pot, so I scraped up all the crusty brown bits at the bottom. Within a couple minutes the sauce had already reduced and thickened up on his own, so I reduced the heat down to medium low. At this point I added the cooked lamb and roasted eggplant back to the pot, tossing with that sauce. ....followed by the capers. Mostly because I was out of green olives, so you could try it either way and it will work. 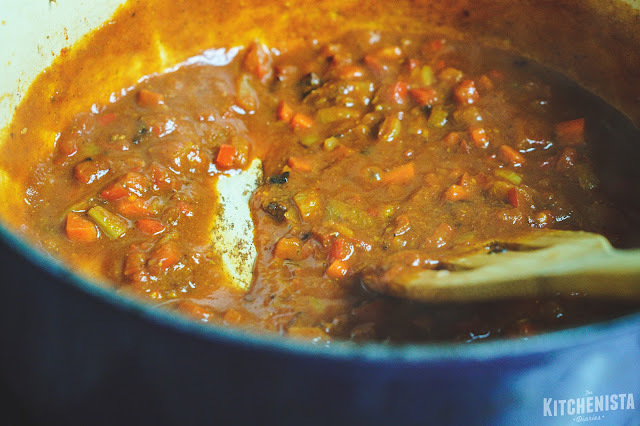 I let that all simmer so the flavors could marry, just for a few minutes. Honestly I could have just eaten it all right here. But it gets better. Everything gets better with fresh mint and cilantro. 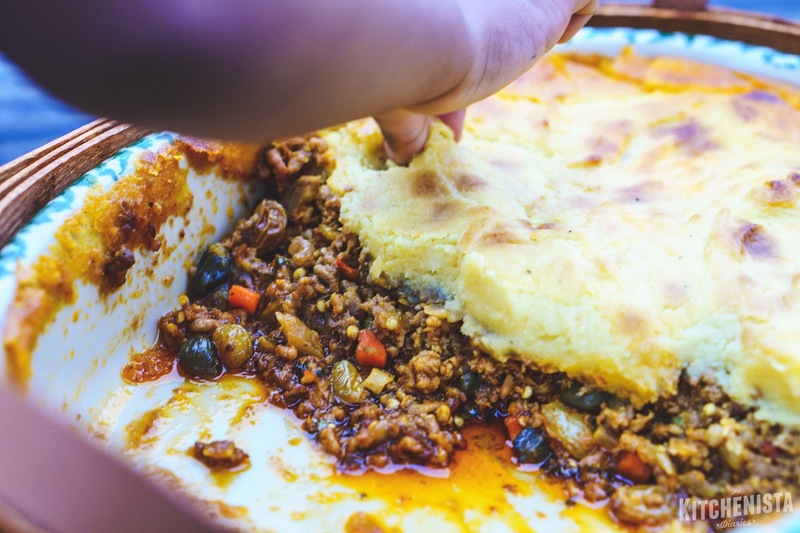 I turned the heat off after that and began to assemble my shepherd's pie, with the oven preheating to 350°F. I lightly oiled my casserole dish and packed the lamb filling into the bottom. 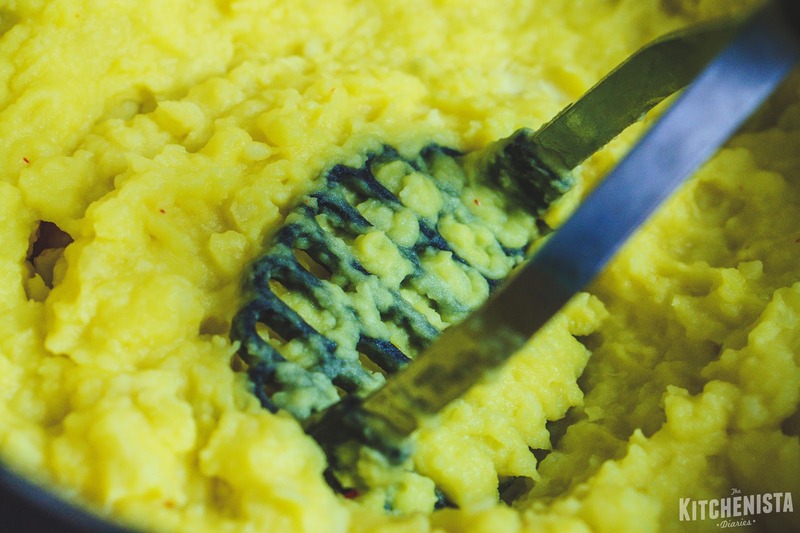 Then I stirred the beaten egg and egg yolk into those saffron mashed potatoes, which had cooled already, and spread them over the lamb filling. I placed the casserole dish over a heavy baking sheet to catch any drips, and transferred it to the oven. It baked for about 30 minutes, until the topping had become crusty and golden brown and the filling was bubbly. As soon as it came out, I immediately thought... "wow, okay I get shepherd's pie now." So don't skip those eggs! I impatiently allowed this masterpiece to cool a little bit before we dug in. The nice thing was that I got to eat before pictures, for a change! It was glorious. The saffron mixed with the Moroccan spices, little pops of sweetness and saltiness and lemon here and there, it was an adventure for my taste buds. I know I didn't make it the traditional way, but I'd love to try a good version of the original now. I hope you enjoy as well! So...we're going right from those healthy collard green wraps and diving into a bowl of luxurious mashed potatoes. The catch? 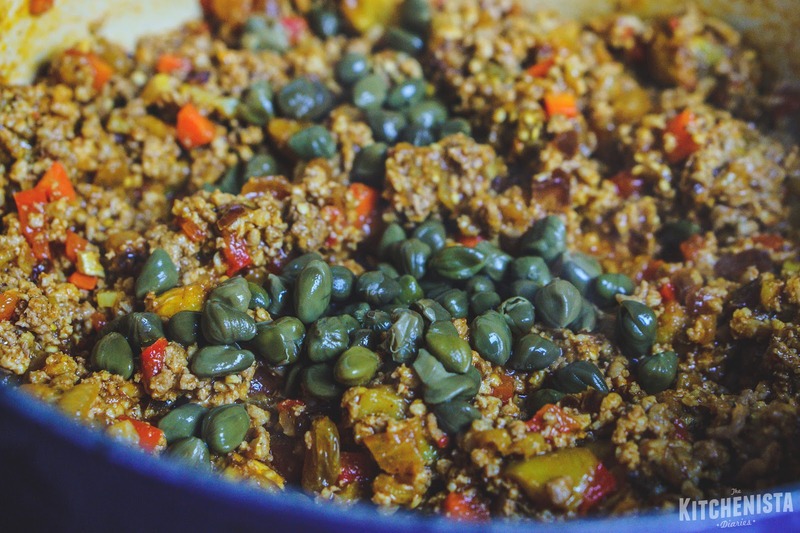 This dish is also Whole 30 compliant. I try to stay away from eating too many starchy root veggies while I'm on Whole 30, but once in awhile that craving hits. So it's nice that you can still enjoy some comfort foods, even without the dairy, sugar or gluten. 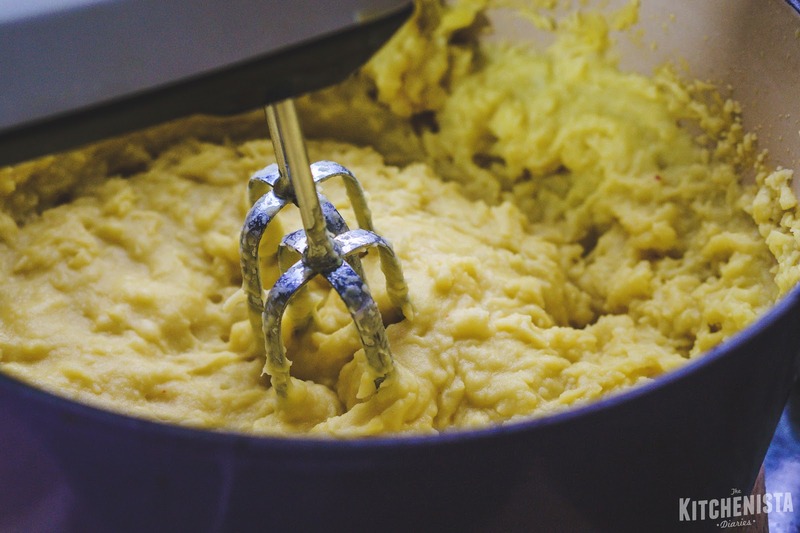 Mashed potatoes are no exception. I used unsweetened cashew milk, ghee (clarified butter) and olive oil for a decadent texture that didn't feel like something was substituted. So while you won't miss the milk or heavy cream, by all means feel free to use it if dairy isn't a concern to you. I was inspired by saffron, a spice that I don't use very often but want to explore. 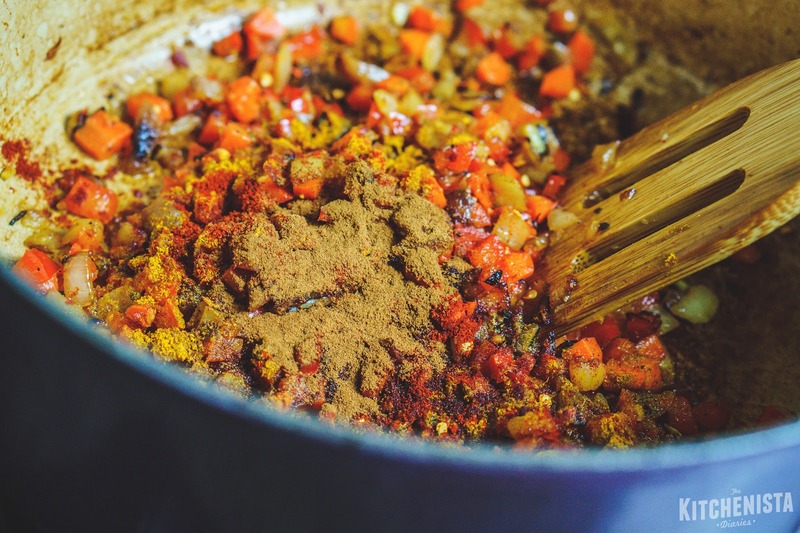 It's pricey (the most expensive spice in the world, to be exact) but you only need a pinch to season a pot of food. Too much saffron can actually ruin a dish, so trust me less is more. 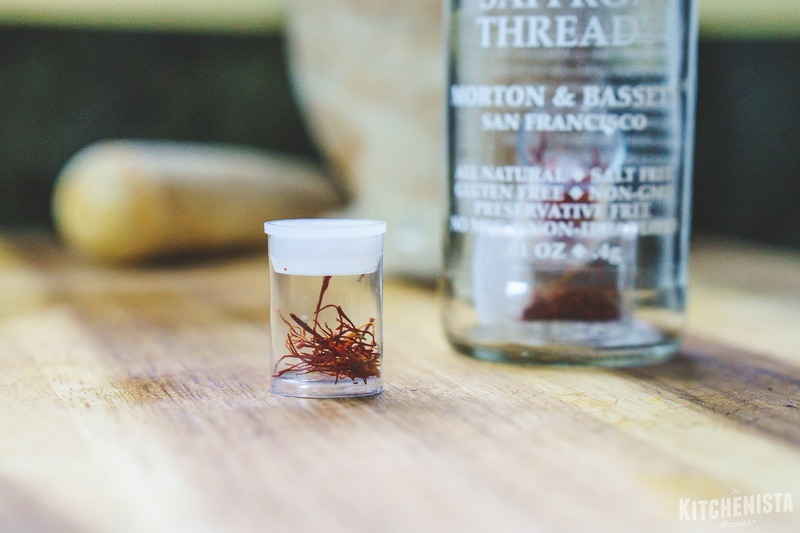 I appreciated that the jar of saffron I purchased came with vials of portioned saffron, so it took some of the guesswork out for me! The flavor of saffron is subtle but unique. I don't know that I've ever read a great description, it's just one of those things you'll remember once you taste it. 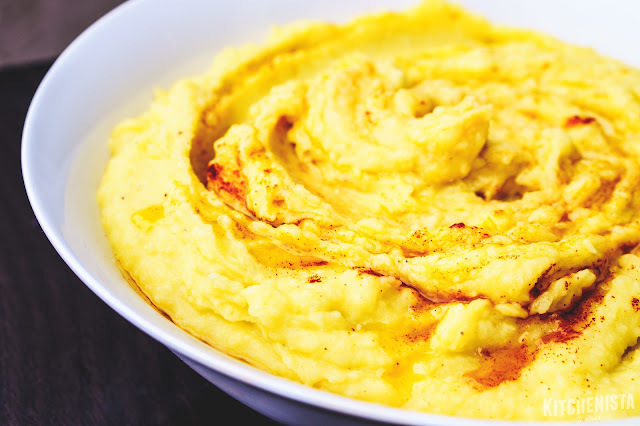 I think it's enhanced by a little bit of sweetness, which is why I included parsnips in the mashed potato mix. 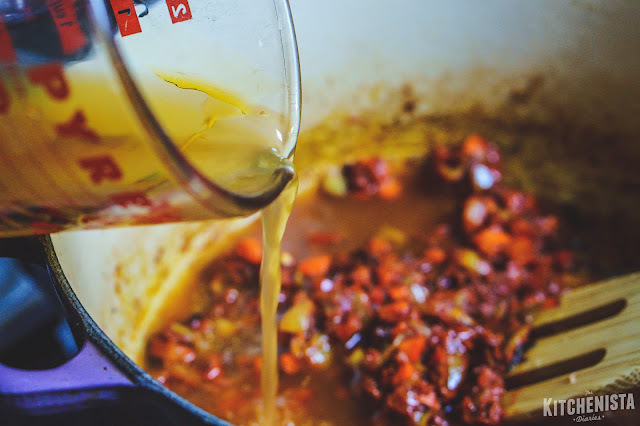 I love the color and aroma of saffron as well, which I think is just as much of what you experience when you taste a dish seasoned with saffron. 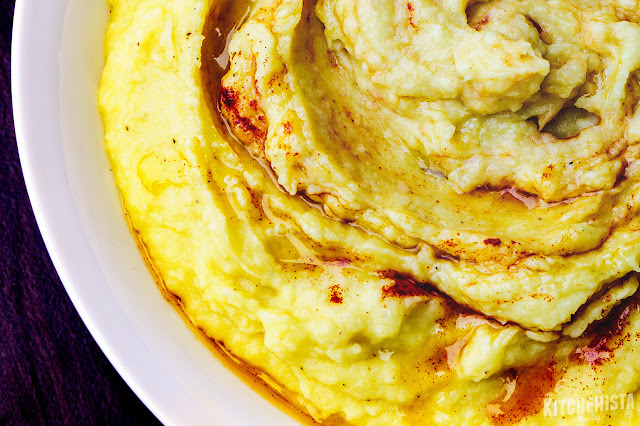 Whatever you do, don't substitute turmeric. Although they'll both give foods a bright yellow color, turmeric is a totally different flavor profile. 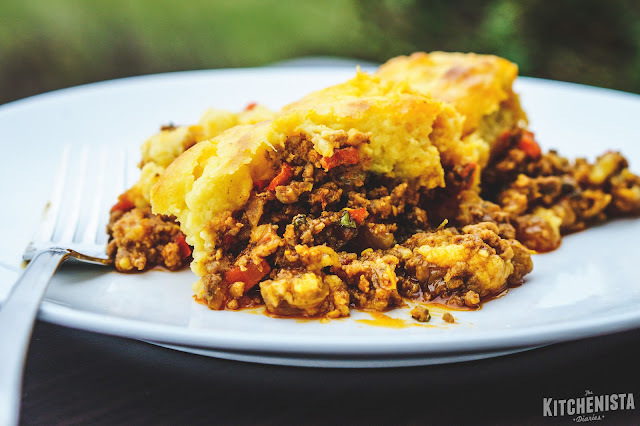 I made my saffron potato and parsnip mash with a Moroccan inspired Shephard's Pie in mind, which I'll be sharing in the next post! 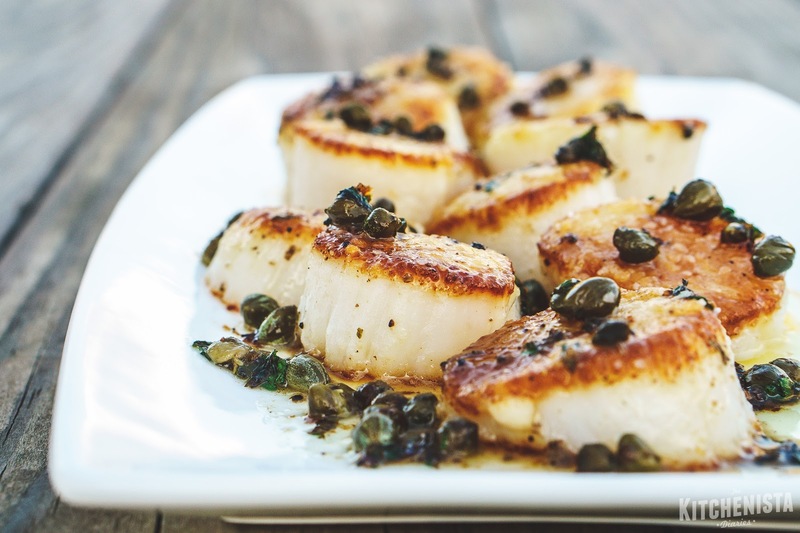 I think this side dish would also be excellent with a nice piece of fish or as an upgrade to your Thanksgiving potatoes. 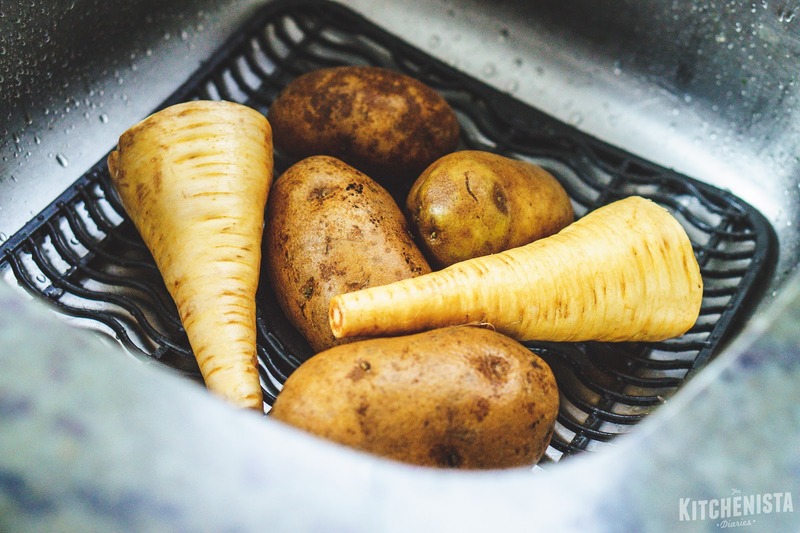 Scrub and peel the potatoes and parsnips. 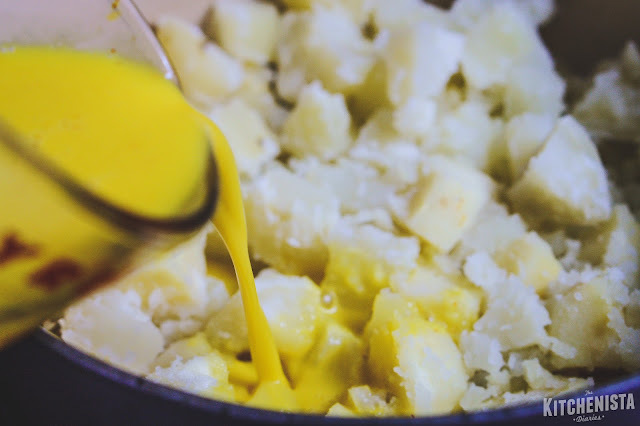 Dice the potatoes and parsnips into one inch pieces and add to a pot of salted water. Add the bay leaves and bring the pot to a boil. 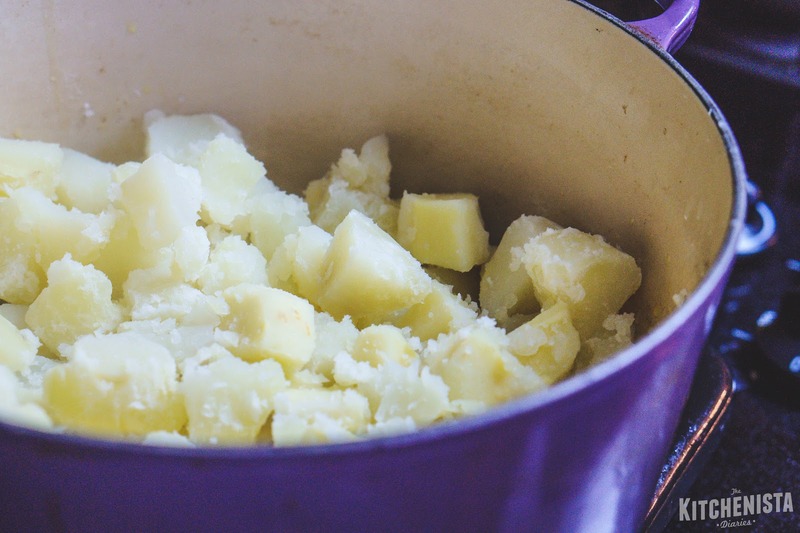 You'll want the potatoes and parsnips to be cut into evenly sized pieces so they'll cook at the same rate. Meanwhile, crush and steep saffron threads in 2 tablespoons of hot water. 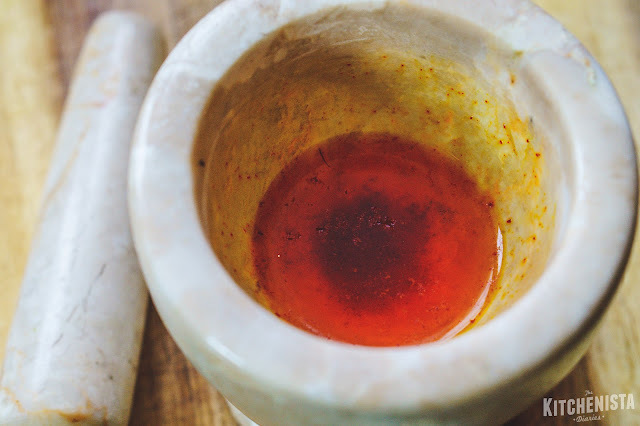 I used a mortar and pestle, but you can use the bottom of a cup or even your fingers if nothing else. Steeping the saffron will bloom the flavors. Gently warm the cashew milk. Whisk in the melted butter and saffron water. Pour the liquid over the cooked potatoes and parsnips. Mash the hell out of everything. Alternatively, transfer to your food processor. (Personally, I'm cool on not washing more dishes!) Once the mixture is mashed and liquid absorbed, season to taste with salt and pepper. As with any mash you may need a little more or little less milk, so adjust as needed. It will look like you have too much milk in the beginning but thickens up the more you get in there. The last step is optional but transforms the texture into something really divine. 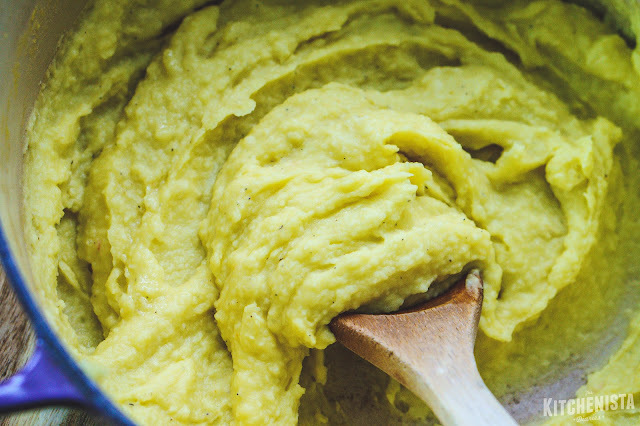 With a hand mixer on high speed (or food processor running), stream in all but about a tablespoon of the olive oil. Now we're talking. Season to taste with salt and pepper again, if needed. To serve, transfer to your serving bowl and sprinkle with smoked paprika. Drizzle the remaining tablespoon of olive oil over the top. Dive in!